Item#-UNI-C7006T.Available in a gallon.Hypoallergenic and made with organic ingredients, this gel offers a smooth, satiny glide. It can be used for all modalities and provides worry-free washout to ensure easy removal and stain-free linens.““Ingredients: Organic Sunflower Oil, Octyl Palmitate (Coconut oil ester), Organic Beeswax, Organic Copernicia Cerifera Wax, Candililla Wax, Laureth 3, Organic Shea Butter, Organic Jojoba Oil, Organic Sesame Oil, Organic Chamomile (Matricaria Chamomile), Organic Lavender (Lavandula angustifolia), Organic Melissa (Melissa officinalis), Organic Passion Flower (Passiflora incarnata), Organic Sage (Salvia officinalis), Tribehenin, Dimethicone.PLEASE NOTE-Gallon Sizes are limited 4 gallons maximum per order in shipment, whether its 4 gallons of the same item or gallons of mixed products throughout the order.If you exceed the maximum of 4 gallons of the same item or mixed products per order, then the order will ship based upon weight of shipment and will have additional shipping charges that will not show up on your internet order but will be additional to your order and appear on your invoice recieved from us.This will overide our “free shipping policy over 99.00 and up. 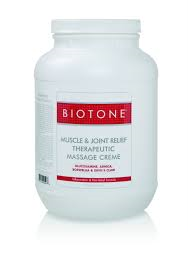 Item#-UNI-C7010T.Available in a gallon.Muscle and Joint Therapeutic Massage Gel is ideal for sore joints and aching muscles. It helps to promote joint wellness and provide soothing relief to strains, sprains, and other injuries. Gives more coverage than oil so you use much less. Smooth, even glide without a greasy feel. Botanical extracts of arnica, boswellia, and devilâs claw combined with essential oils of eucalyptus, balsam Peru and wintergreen work together to assist in fast recovery.““Ingredients: Sunflower Oil, Octyl Palmitate, Beeswax, Tribehenin Wax, Candelilla Wax, Laureth-3, Carnuba Wax, Jojoba Oil, Olive Oil, Grapeseed Oil, natural botanicals of Arnica, Boswellia (Boswellia Sacra), Devil's Claw (Harpagophytum Procumbens) and Lemon Bioflavanoids. Eucalyptus, Bergamot, Balsam Peru, Wintergreen, Lietsea Cubeba Essential Oils, Dimethicone, Vitamin E.PLEASE NOTE-Gallon Sizes are limited 4 gallons maximum per order in shipment, whether its 4 gallons of the same item or gallons of mixed products throughout the order.If you exceed the maximum of 4 gallons of the same item or mixed products per order, then the order will ship based upon weight of shipment and will have additional shipping charges that will not show up on your internet order but will be additional to your order and appear on your invoice recieved from us.This will overide our “free shipping policy over 99.00 and up.